Billy Crash Craddock / TVparty! Growing up in Greensboro, Billy Wayne Craddock loved two things, football and music. Jim: Who was your favorite singer when you were a boy? Crash: I had a lot of them, Hank Williams, Faron Young, Jim Reeves, but my very favorite was Carl Smith. Jim: So how did you get the nickname “Crash”? Crash: A lot of people think I got it from racing cars, and where that came from was Marty Robbins introduced me one night as a “race car enthusiast”. Actually, I got it from playing football, believe it or not. I played right half back and my brother played left, and I was the smallest man on the team. So when the guard or tackle would open up a little hole, I was gone, ‘cause the other guys were so big I didn’t want to get hurt (laughs). But young Crash dreamed of making hits, not getting hit, so in 1957 he made his first professional recording at a local studio, singing the Rock-a-Billy song, “Smacky Mouth”. The following year he was picked up by Columbia records as their answer to Elvis. In 1959, Craddock, the Everly Brothers, and several other performers were booked for a concert tour of Australia. Sometime earlier, Crash had filmed a black and white demo of “Boom Boom Baby”, but unbeknownst to him, the film had made its way to Brian Henderson, popular host of a “Bandstand” program on Australian television. Said Henderson, “We played the film many times, and we were able to promote Crash Craddock so successfully that he was able to fill stadiums all over the country, and made several live appearances on “Bandstand”. Crash: When I landed in Sydney, there were thousands of fans waiting, and I thought they were screaming for the Everly Brothers, but they had turned out for me because of the video that had played on Australian TV. In fact, “Boom Boom Baby” became the number one hit down under, and Crash became a super star in the land of Oz. Over the next two decades, Billy became the international King of Country Rock music, and racked up a number of hits here in America, including the sexually suggestive, “Rub it In”. Not long after he was inducted into the North Carolina Music Hall of Fame, Crash went to see a comedian perform at High Point Theatre, and one of the ushers recognized him. “You know, I’ve never played here,” Billy told the usher. “Wait a minute, I want to introduce you to somebody,” said the usher, who then brought Crash together with Dave Briggs, director of the Theatre. Briggs and Crash finally got their schedules to jive, and Craddock headlined a special show in the Summer of 2016. On April 27, Crash returns to High Point Theatre for a much-awaited encore performance. On a recent visit to “Triad Today”, I asked Crash why he chose to remain in Greensboro, when he could have lived in so many other cities. Crash: Jim, I love it here. When I go somewhere, I know how to find my way back. They asked me to move to Nashville several times, but I told them, “Look I love my hometown. When I die, they’re going to put me in a pine box and send me back home anyway, so there’s no need to move. I’ll just stay right here” (laughs). I also asked Crash, now 79 years old, if women still throw their under garments at him on stage. Crash: No. Now they throw Depends (laughs). 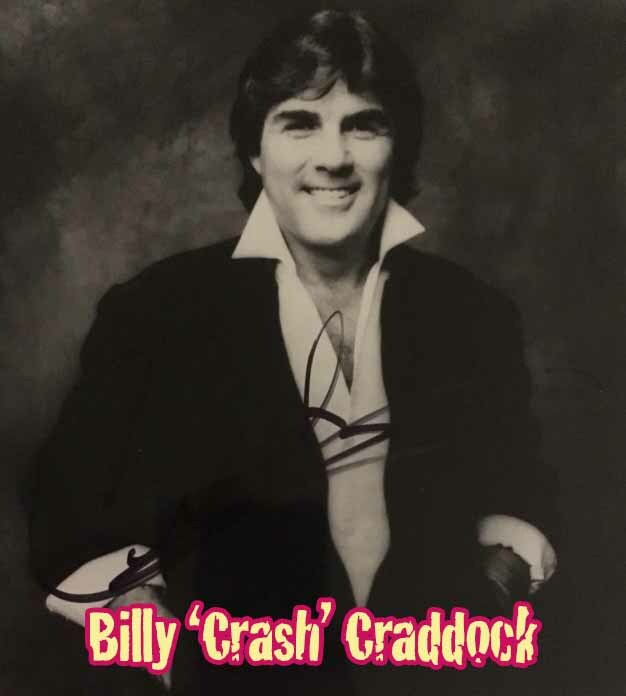 You can listen to and throw your underwear at Billy Crash Craddock, Saturday April 27 at 8pm at High Point Theatre. For tickets, visit www.highpointtheatre.com or call the box office, (336) 887-3001. Classic TV Commercials / 1950's TV / 1960's TV / Punk Book / / 1970's TV / Groucho vs William F Buckley / TV Games / Honey Boo Boo / Lucy Shows / Classic Cars / John Wayne / Gene Roddenberry / Rockford Files / Sea Hunt / Superman on DVD / Toy Gun Ads / Flip Wilson Show / Big Blue Marble / Monty Hall / Carrascolendas / Mr. Dressup / Major Mudd / Chief Halftown / Baby Daphne / Sheriff John / Winchell & Mahoney / Fireball X-L5 / Mr. Wizard / Captain Noah / Thanksgiving Day Specials / Disney's First Christmas Special / Saturday Morning Cartoons / The Magic Garden / Amahl & the Night Visitors / Holiday Toy Commercials / Lucy & Desi's Last Christmas Show / Joey Heatherton / Fat Albert / The Virginian / Bewitched / Death of John Wayne / 1974 Saturday Mornings / Chuck McCann / Rudolph Collectables / Shrimpenstein / Local Popeye Shows / New Treasure Hunt / 1966 ABC TV Shows / 1967 TV Shows / 1968 TV Shows / Ric Flair, Dusty Rhodes & Baby Doll / Fridays / TV Moms / Red Skelton / Star Wars / KISS / Lancelot Link / Saturday Morning Cartoons / The Magic Garden / Wonder Woman / Classic Comic Books / Andy Griffith / Cher / TV Shows on DVD / Outtakes & Bloopers / 1967 TV Shows / Romper Room / ABC Movie of the Week / The Goldbergs / Daws Butler Commercials / Saturday Morning Commercials / Captain Kangaroo / Chicago Local Kiddie Shows / Boston Local TV / Philly Local TV / NYC Local Kid Shows / Amos 'n' Andy / Electric Company / Bette Davis / Judy Garland / Christmas Specials / Redd Foxx / Good Times / Sitcom Houses / What's Happening! / Winky Dink & You / Sonny & Cher / Smothers Brothers / Commercial Icons of the 1960s/ Soupy Sales / The Carpenters / Route 66 / Bozo / The Carpenters Christmas Specials / Local Kid Shows / Death of TV's Superman / Wonderama / Sesame Street / Bob Hope Specials / Little Rascals / 1980's Retro Gay T-Shirts / 1980's TV Wrestling / Fess Parker / Howdy Doody / TV Blog / Lost In Space / Pinky Lee / 1980's LA Punk Rock / Alex Toth Book / TV Terrorists / Irwin Allen / The Untouchables / Carol Burnett Show / Batman TV Show / Green Hornet / Today Show History / Our Gang / Doris Day Show / 1970's Commercials For Women / Bill Cosby in the 1970s / The Golddiggers / Lola Falana / 1970s TV Shows / David Bowie on TV / Hudson Brothers / Jackie Gleason / Hollywood Squares / Match Game / Bob Keeshan / Gumby / The Flip Wilson Show / Glen Campbell Goodtime Hour / The Bobby Darin Show / The Richard Pryor Show / George Burns / Celebrity Commercials / Rudolph / Movie Posters & More!